Udaipur : Tata Hitachi has been a prime mover in leading sustainable development in the fields of Infrastructure &Mining for decades. Focused on delivering global excavation and haulage solutions to suit Indian working conditions, Tata Hitachi has embraced all the challenges that have come its way. Tata Hitachi prioritizes service and parts support to customers through a strong distribution network. Which includes a marketing head office, regional offices, branch offices and dealerships spread across the length and breadth of the country. A leader in site support operations, Tata Hitachi offers a complete scope of support solutions such as Full Maintenance Contracts, Site Support Agreements, and Annual Service Contracts etc. A pioneer in introducing the latest technology for hydraulic excavators, Tata Hitachi has migrated its products to incorporate features like online access to location of equipment, online health monitoring system, automatic sensors and alarms for machine health, maintenance, electrical excavators, AC drive rigid dump trucks, etc. In addition to this, the organization has introduced ConSite - an IT enabled tool through which machine reports are transmitted to the customers’ e mail ID : helping them make their operations smart & efficient. The parent company - Hitachi Construction Machinery Co. Ltd., Japan - has also been continuously evolving technology for mining excavators and rigid dump trucks. Hitachi offers a fleet management system - “WENCO” - to make equipment utilization effective and efficient: thereby making the mining operations more productive. 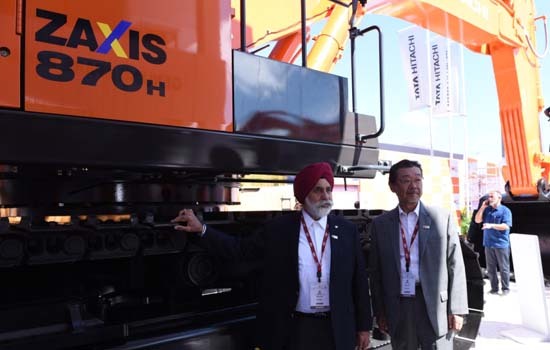 Speaking at the Tata Hitachi pavilion, Mr Sandeep Singh, Managing Director, Tata Hitachi said “At IMME, we are demonstrating our unmatched strength in Mining by showcasing our Hydraulic excavators: ZX870H, ZX650, ZX470H (Backhoe),& the Wheel Loader TL340H. Along with this, our support pavilion showcases ConSite , the Training Simulator , the FMC Pavilion , attachments (Rock Breaker), spares support counter and the new Hammerless tooth points designed and developed by Hitachi for the Ultra Large Class of excavators. Mr. Shin Nakajima , Director Sales , Marketing and CSD mentioned : “Tata Hitachi is committed to skill development to improve employability and social upliftment. The India opportunity presents a large volume of development pending to be addressed in infrastructure and mining. High performance equipment supplied to the market demands a bank of trained operators, mechanics, service personnel and project managers. To meet this challenge, we have set up Skill Development Centers and Operator Training Schools at Kharagpur and Dharwad”.